Lighthouse Leads the Way with Direct View LEDs Offering Incredible Imagery, Easy Installation | KMB Communications, Inc.
Costa Mesa, CA (May 2018) – Lighthouse Technologies Limited, a leading global brand in direct view LED video display solutions with a 20-year history in the USA, showcases incredible imagery and simplified signage solutions at InfoComm 2018. Designed to address and eliminate many of the barriers to entry for direct-view LEDs in commercial applications, the Quantum q-Series and Dynamic Series deliver high dynamic range imagery across a wide color gamut. The Quantum q-Series includes proprietary, first-of-its-kind Peak Luminance Enhancement (PLE) technology for noticeably higher contrast levels and increased luminance. Lighthouse direct view LEDs have an established footprint in indoor and outdoor applications. Their ultrabright imagery enhances the experience at world-famous stadiums and other professional sports venues, as well as in the center of Times Square. 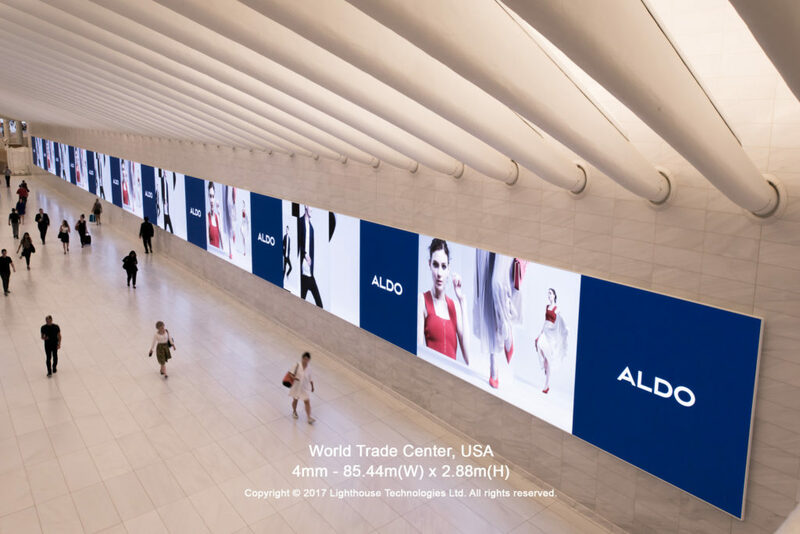 Lighthouse’s digital signage solutions also add flair to Westfield shopping properties worldwide and inside New York’s World Trade Center, where the Quantum q-Series are currently in use. Designed to support high pixel density indoor applications, Lighthouse Quantum q-Series fine pitch LED indoor displays offer long life and best-in-class contrast for superior image reproduction even in high ambient light environments. Available in 1.5mm, 1.8mm, or 2.5mm pixel pitch, the q-Series boasts truly revolutionary and highly differentiated technology inside each panel. to eliminate problems characteristic of other display solutions. Available for the first time in the category, Lighthouse’s proprietary Chromatic Modulation Technology (CMT) features an integrated photosensor mounted inside each panel, continuously measuring the output for each LED module. The CMT nerve center automatically corrects for luminance and uniformity, addressing issues that other technologies ignore as they age or when they are swapped out for repair or maintenance. Lighthouse Quantum q-Series direct-view LED panels virtually eliminates these problems. The Lighthouse LEAP-S processor and proprietary processing algorithm convert 8-bit video source materials to 10-bit HDR output, providing a new level of versatility and taking advantage of HDR performance for existing source material. Peak Luminance Enhancement (PLE) technology increases peak luminance and enables higher contrast ratios and a wider color space through proprietary HDR technology. High Dynamic Range (HDR) is a content and display standard that provides performance guidelines for manufacturers to follow. Lighthouse differentiates itself with the introduction of their proprietary Peak Luminance Enhancement (PLE) to enhance the HDR experience. Within the q-Series displays, the LEAP-S processor system can sense the incoming video source and analyze it to locate bright areas in the image (within 3-7 pixels) that surround areas that are a lower level of brightness. The PLE technology then adapts the gamut curve for those bright areas, to enhance their luminance approximately 20 percent. This provides a noticeably higher level of contrast. The difficulty is to provide this analysis and manipulation without introducing extreme frame delay between the input signal and the display. Lighthouse provides industry-leading single frame delays throughout the PLE process when HDR is enabled. PLE helps create a more impactful video experience for any application, from restaurant menu boards to retail signage and even interactive displays. LCDs may dominate the conversation for most display applications but for big images, the future lies in fine-pitch direct-view LEDs. Mirroring the simplicity of ordering an LCD display or TV, the new Lighthouse Dynamic Series LED displays ship as complete, preconfigured units. Modules inside Dynamic series displays are cable-free and can be serviced from the front via a magnetic tool. Showing for the first time at InfoComm 2018, the Dynamic series now includes two new sizes to meet a wide variety of commercial applications. 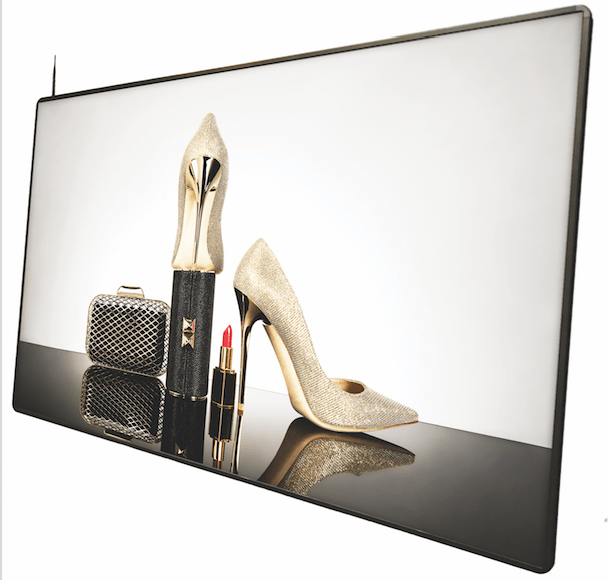 A new 104” model fills a niche for digital signage, retail, and hospitality applications. A stretched aspect ratio 80” version is ideal for specialty applications, including wayfinding. These new models join the current lineup that includes 89” and 118” models in a 16×9 configuration. Dynamic series displays offer simplified plug and play integration and connect to standard video sources via HDMI, and have a built-in media player with Wi-Fi, LAN, and USB connections for ease of installation and set-up. For digital signage applications, each display comes with a content management system (CMS), and includes scheduling tools plus a group of pre-designed templates. The Dynamic is priced competitively with comparably sized flat panel configurations and makes it easy for integrators and consultants to specify and install fine-pitch direct-view LED displays. With a rich history in commercial integration and large-venue display technologies, Lighthouse LEDs were previously sold under the Panasonic brand, leading the competitive pack for indoor and outdoor direct-view LEDs. Now available in the U.S. to meet the ever-changing needs of commercial integrators and to deliver the best video experiences in a wide range of indoor applications, Lighthouse LEDs and revolutionary PLE technology can be seen at InfoComm 2018 booth N3354 in the Las Vegas Convention Center June 6 – 8, 2018.